A great way to encourage their development in a range of different areas, add our Sensory Liquid Shapes Assorted Small 3 Pack to your basket today. Nurseries and Preschools alike will love the versatility of these handheld toys that have each been constructed from a durable, transparent plastic. Internally, coloured oil and water have been combined to create a bobbled mixture that flows between both divided sides as a way of tracking the progress of time. 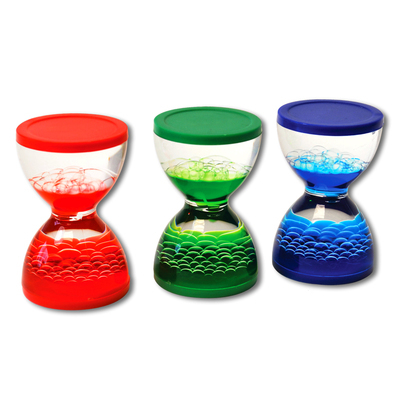 Encourage children to upend each of the three different colours shapes and stare on in amazement as tiny droplets appear to float effortlessly through the timer. This pack comes with 3 different sensory liquid shapes colours to choose from and can be stored alongside your existing sensory toys. Here at Gompels, we have a wide range of Sensory Toys to help with your classes development. With everything from our Sensory Blocks 16 Pk and our Sensory Flashing Balls Texture 4 Pk through to our Sensory Mood Light Table and our Sensory Mood Ball all at economical prices.